Is intent based search optimisation the new SEO ? In this article I look at the process of creating your content to match your prospects intentions and the context in which they search to meet those intentions. Matching your digital content assets to your prospect’s intent and context is an integral part of improving your websites ranking which in turn will help generate more traffic to your website which improves your chances of generating more prospects who may turn into leads through their interaction with your brand. I like to think of the structure of business as a funnel shape and at the top, we’ve got cold traffic, in the middle, warm traffic and at the bottom, the hottest traffic. When we go out to the market online or even if we’re marketing offline, the coldest traffic are unaware, unaware of us, unaware that they’ve even got a problem. Now what happens is eventually they identify a problem they have and they become problem aware, or we help identify a problem they may have through marketing. 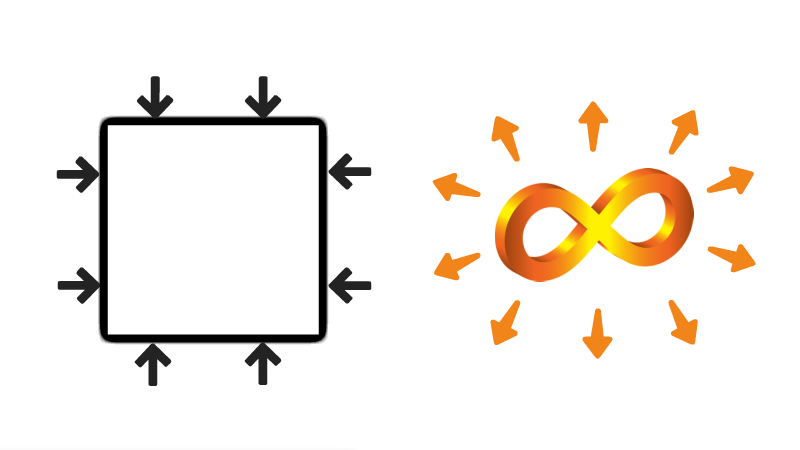 Then they become problem aware, gradually as they move through your funnel they become solution aware, they’re aware of something there to help them. Then hopefully they become product aware, or they become aware of you. Then at the bottom they’re fully aware because they’ve purchased from you. 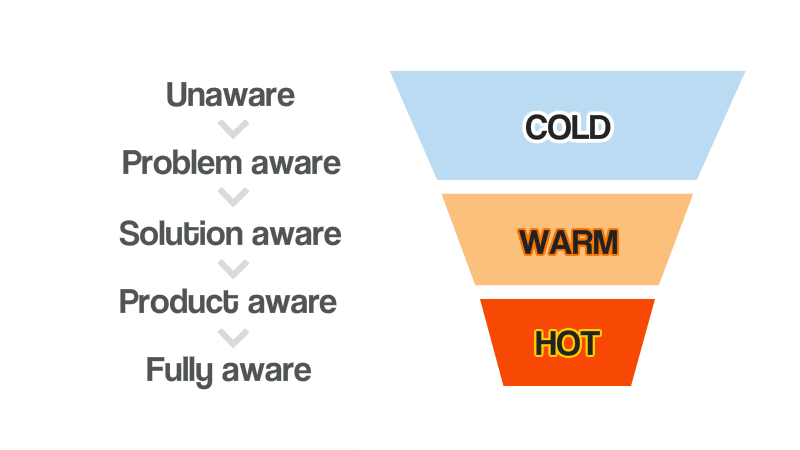 The object of this series of articles about improving your customer journey is to help you move people from cold to warm to hot prospects and from unaware to fully aware. Let’s have a look at how we’re going to do that. There are several things that I really want to talk about that are going to help you speed up your customer journey. The first is Intent based search optimisation. This is something that we’re going do with your website and have a look at how we can do things online. The second thing is something I call “Lighting the Path”. We’ll dive into that a bit later. Then I’ll take a look at “Leveraging Conversational Selling”, because talking to one another is one way to move prospects through the sales funnel quite quickly. First up, let’s have a look at Intent based search optimisation. What do I mean by Intent based search optimisation? Here is one of my customers. This customer wants to learn how to frame pictures because they’ve bought a new home and their walls are bare. What we get in that conversation is both the intent and the context of what they’re searching for. In this example, “I want to learn how to frame pictures because I’ve bought a new home and my walls are bare.” “The learn to frame pictures” is the intent and “The bought a new home, and my walls are bare” is the context. Now what this person will do or what any prospect does now is search online. They could be looking in a number of different search engines or places for solutions that meet both their intent and the context of their search. Here is a big problem all businesses face because people are searching not just on one device, they’re searching on multiple devices across multiple different channels. In this example we might have someone using a tablet to search on Pinterest for a particular solution to their problem. They might go looking for it in a number of different places. They’re trying to find a solution that fits their needs. This is something all people do that have an intent and context in mind, they’ll keep searching until that need is met and until it is satisfied. If they don’t find what they are looking for on Pinterest, they might then a couple of days later, a week later or even on the same day also look on YouTube and in this example, they’d be using say a desktop. Now it doesn’t matter what device they are using but you have to understand that customers are using different devices and looking in different places. They might be looking for solutions at a different time and place on their Desktop at YouTube. Then maybe a few days later they could be on their mobile device looking on Google Maps to try and find a local business. How do you target these people when they’re using so many different platforms and so many different devices? We’ll look a few solutions shortly but first let’s take a look at a traditional business model and compare it to a new way of thinking about business. In the old business model we were constrained by what fitted within the four walls of our business. We could only hold so much stock and only attract so many people to our specific location because of the constraints. Today with the Internet, business now has access to unlimited space. We’re able to put a whole heap of content out there. We’re not just constrained by the physical products that we have to keep within our business. This is a concept I want you to understand in that you’ve got this huge abundance which been brought about by the internet and you’re able to leverage the internet to make the most out of your business. 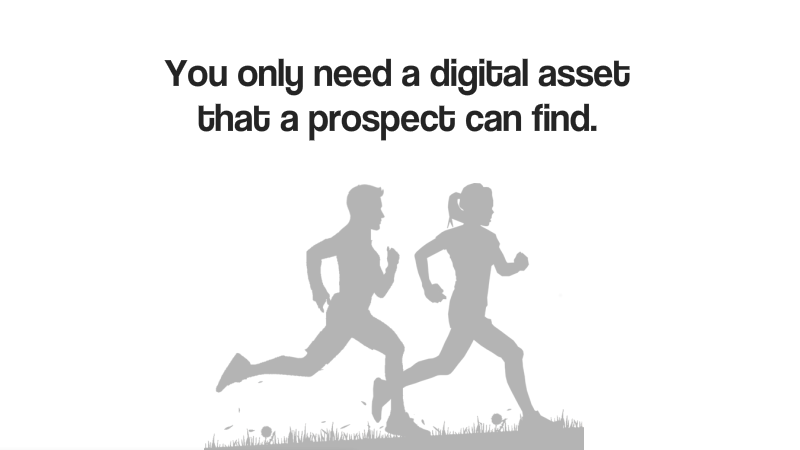 The only thing you really need when you’re competing for a search term on the internet is a digital content asset that a prospect can find. Unlike having to have something in a store and advertise and have them come to your store, all you really need to do is have something out there, a content asset that you’ve created that the customer finds. Then they follow that scent back to your shop or back into your business into your website. Here’s a graph of the Search Demand Curve from seomoz.org illustrating the long tail of search. This graph helps explain the relationship between the popularity of search terms and the number of searches made that are made from inside the major search engines. You can see even the top 10,000 keywords only make up 18.5% of all the searches. This is important because when we look at the long tail of search you can see it makes up 70% of internet searches. That is a huge amount of traffic. In fact what we’re going to talk about further is how we target the long tail, because as you move toward the long tail, there’s less competition and it’s easier to attract those customers. 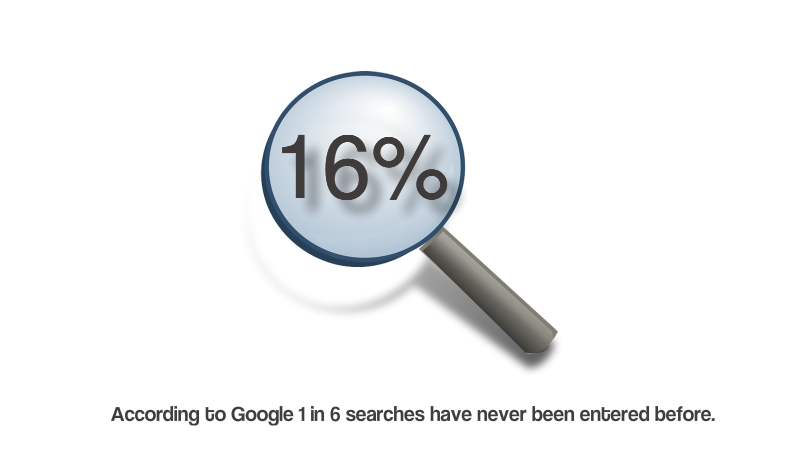 Another interesting fact is according to Google, 16%, so that’s 1 in 6 searches, have never been entered into Google before. 1 in 6 have never been entered before, now that’s a whole gold mine of opportunity for you to add content to meet those 1 in 6 searches. Cold, warm and hot prospects have different intentions and the contexts of their searches will also vary. In this example, “I want to learn to frame pictures because I’ve bought a new home and my walls are bare.” This is someone who would be considered as cold traffic. They haven’t got anything in mind. They just know that they want to frame some pictures because they’ve got bare walls. They have higher level of intent and are a warmer type of prospect. The warmest type of prospect is someone who is closest to becoming a buyer. 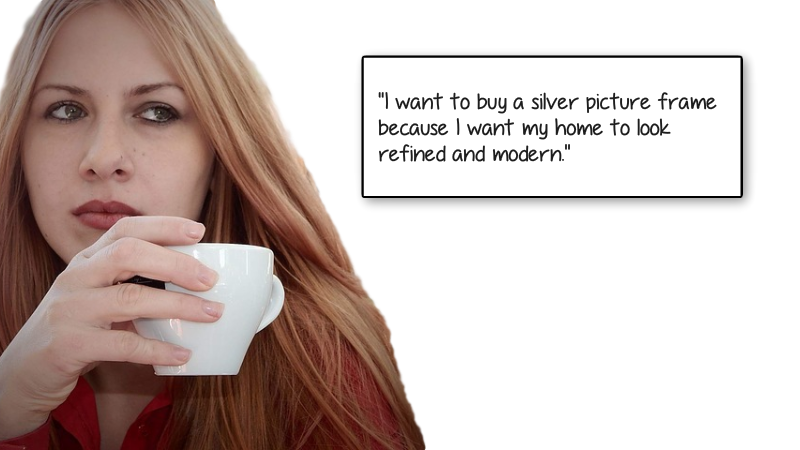 In this example the prospect states that they want to buy a silver frame because they want their home to look refined and modern. In this example, they’re very close to the buying point. When someone is close to the buying point, they are using words like, compare, buy, get reviews, etc and other similar hot words. We’ll look at that a little bit more at these hot words in a minute. Let’s have a look at how we apply keyword modifiers to intent based search queries. 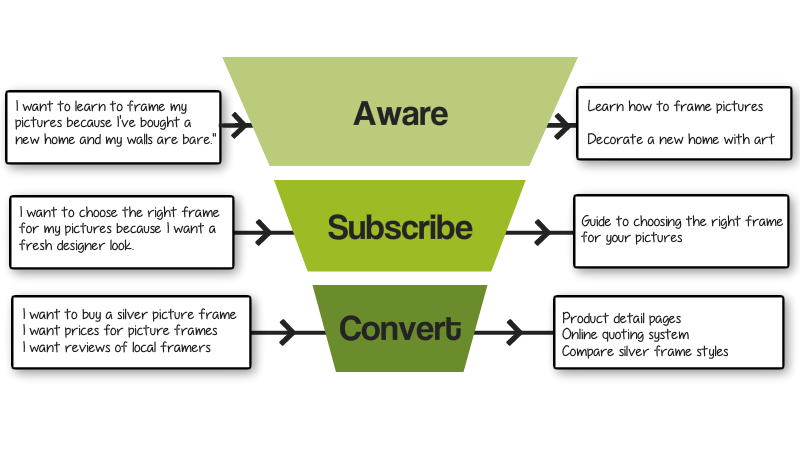 Here is an example of a potential customer journey. It could be the same prospect at each of the stages of cold, warm and hot. They could be wanting to learn. They could be wanting to choose the right frame. They could also be wanting to buy a silver frame as we help them ascend through the buying process and become a customer of our business. I’d suggest setting up a spreadsheet in Excel or Google sheets and begin to plan out your intent based keywords and what content or digital asset you are going to create or one you have already created to meet those relevant keyword searches. We’ll talk a little more about how this content works in a moment. When it comes down the hot end of the funnel where the prospect is likely to make a purchase we might have several content pieces like product detail pages or an online quoting system and some comparison components where people can compare products and competitors. This is why Australian businesses like say “Compare the Market” or “iSelect” do so well because they’re targeting the comparison market which are very hot customers. I’m not going to go and compare health insurance if I’m not going to buy it. Someone who’s entering their system is actually very close to buying. So they are targeting very hot customers. You’ve got to think about these things when planning your content and ascension paths. A quick word about keywords. Researching keywords your prospects might use should go deeper than using Google Keyword Tool because although the tool will deliver searches and estimated traffic the keywords it delivers are based on the most popular keyword searches and as we’ve shown before this a only a small percentage of the total number of searches. You are better off creating customer personas or customer avatars and then taking each of those and creating an intent based avatar to help you identify the most likely search terms to match your prospects intentions and their context relative to your niche. You should also consult your sales staff and listen to what your customers and prospects are telling you. 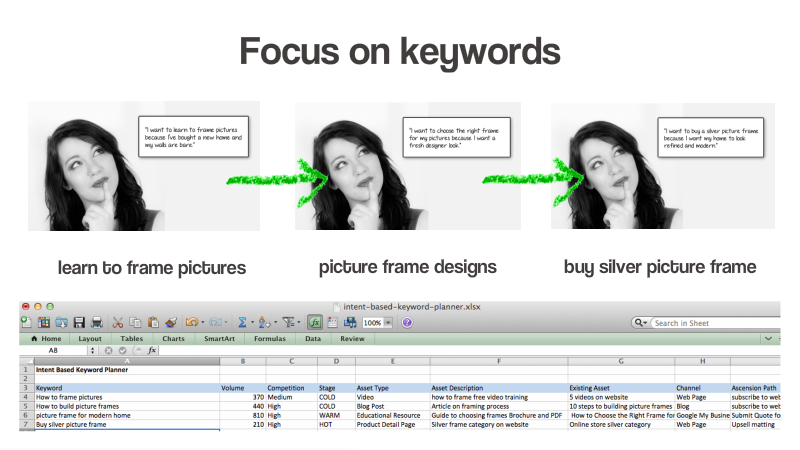 Once you’ve got relevant keywords you can modify them according to where they are in the funnel. In the example of something to do with picture framing, we could use the keyword “picture framing” plus the word “news”. “Picture framing news” is a very cold term or another “picture framing tips” or “lists of 100 picture frames”. They’re all cold traffic search terms. 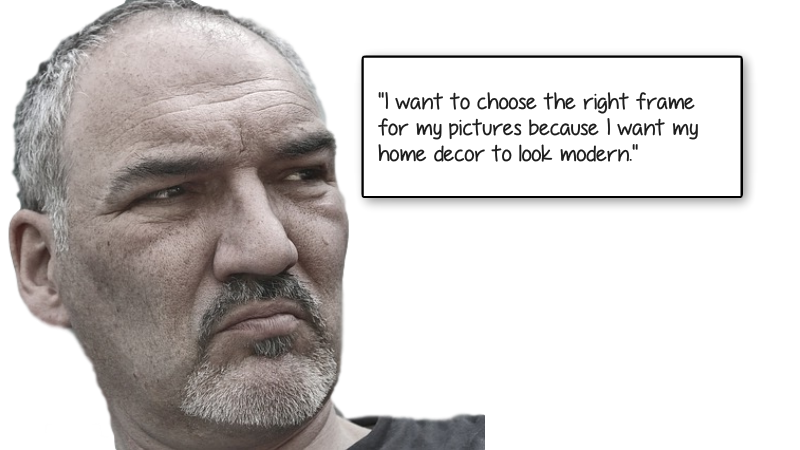 You’ve got modifiers that you can use to add to the same word, so for example “buy picture frames” is a hot term. “Purchase picture frames” or “compare picture frames”. Those are hot search terms targeting people who are ready to buy. 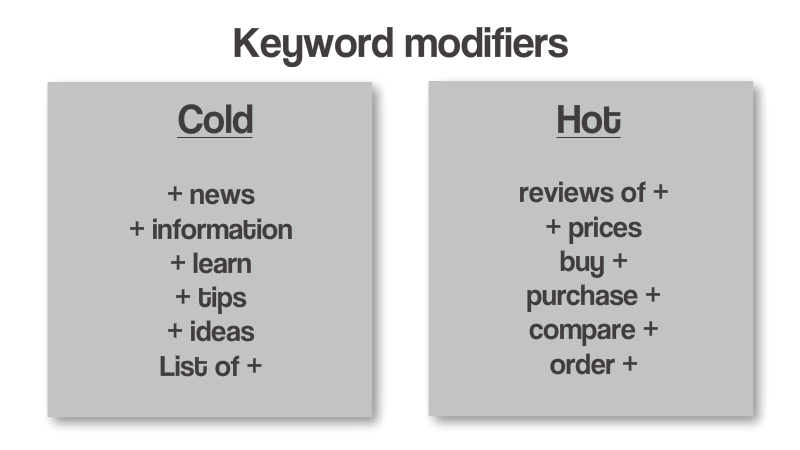 Think about what you can use as modifiers to add to your keywords from the context that the customers are searching for. Your prospects each have different intentions and different context relating to their intentions so use that to develop your keywords. The next thing to do is to create content around the keywords you have identified from your research. In this example here’s our three stages of the funnel represented by the same prospect moving from cold to hot with each at different stages of their journey. In the cold stage, here is the asset that I made for the person who was wanting to learn picture framing. We made a little series of video training to help them get started. The second option here was the person who already has an understanding that they need a picture frame so they are a warmer prospect. They want to make the right choice of picture frames so we created a resource which was “How to choose the right frame for your pictures.” That content resource is a downloadable PDF and also a printed brochure. 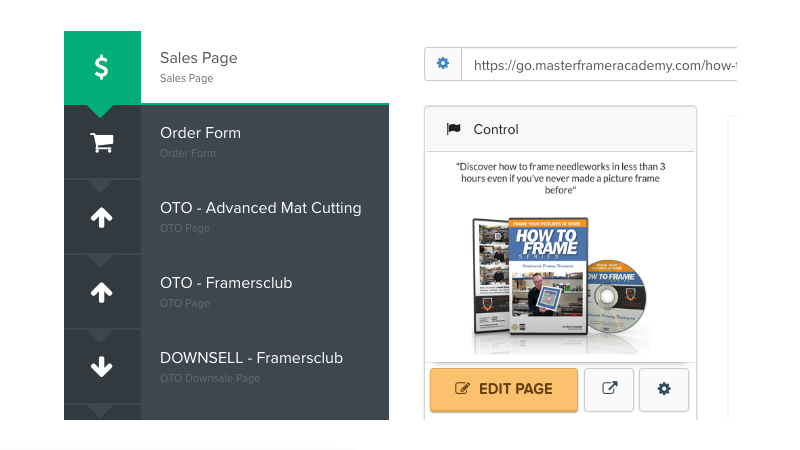 At the hot end of the funnel where the prospect is closest to buying we’ve created a variety of product detail pages and other assets to help them purchase easily. Make pieces of content to match the intent and context for prospects searching at each stage of their customer journey. What you need to think about is creating an ascension path so that when someone comes in, and they’re cold, they want to learn about it, then you move them up to a warm stage, eventually to a hot stage and then eventually they become a customer. Which channels should you publish content on? 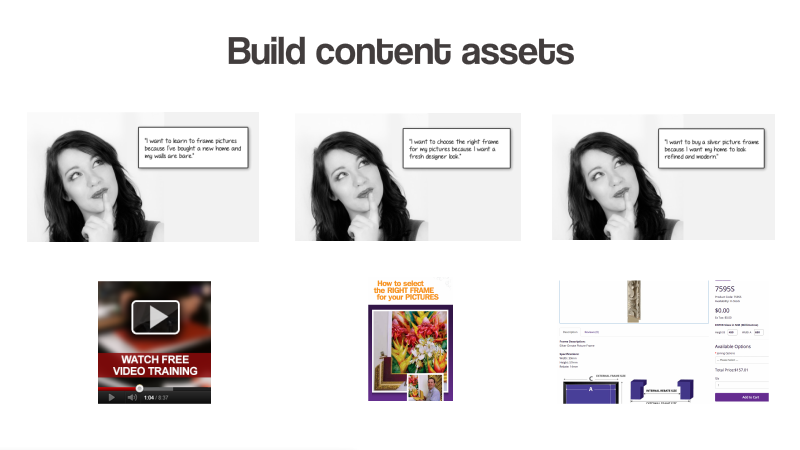 The next thing, after you’ve created your content, is to think about the channels that you’re going to put your content assets on. 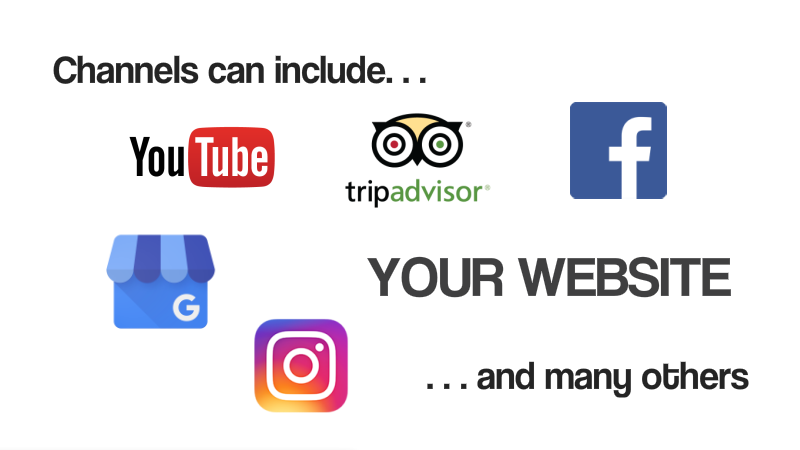 Channels can include YouTube, TripAdvisor, Facebook, Google My Business, Instagram, Your Website, and many others. A really useful resource for you if you want to learn where your customers are looking and this is very important after you have made your customer avatars. These channels are where your customer’s hangout. The places they like to visit. Imagine a perfect customer, note down all the things about them. 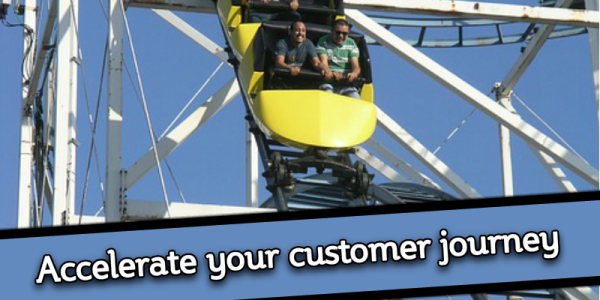 You can look up how to create a customer persona or customer avatar. Here is a good example. When you’ve got that, you can work out where they are and where they congregate regularly. There is a great tool you can use which is called the Conversation Prism. You can get your copy at conversationprism.com. It shows all the different social channels. You can see where your people are hanging out. It is very useful for targeting where to publish content for your specific prospects in your market. After you’ve made your content and you’ve put it online the next step is to optimise it. You need to get traffic to your content and once you have traffic you need to monitor and identify which content is generating the most interest. Once you know the pieces of content that are generating the most interest and engagement you can do several things to improve the results they deliver over time. 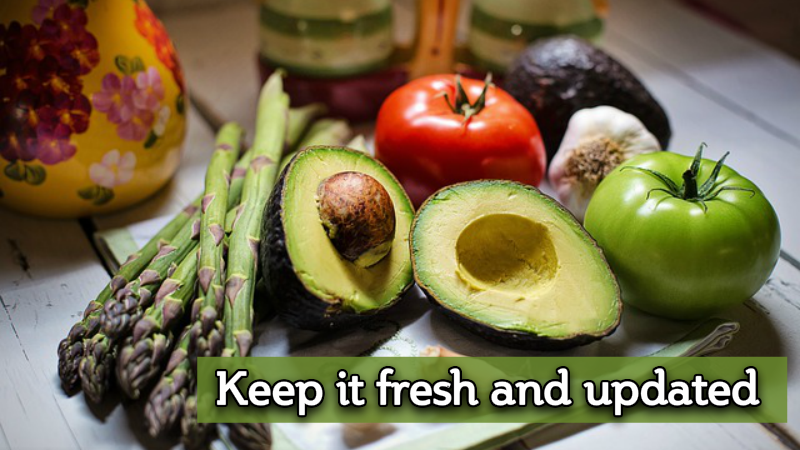 One of the important things is to keep it fresh and updated. What I mean by that is you might make a great piece of content but the content can become stale or out-dated over time so you need to freshen up your content. Much like weeding a garden to maintain its beauty and productivity you must weed out parts of your content that could be past their use by date and add new additions to make it more relevant. Google and the other search engines like freshness. If they were looking at news stories for today or this week for example, no one would want to know what the old news was because they’re looking for current information. Google is always trying to deliver fresh content to its viewers because they are a revenue driven business. They want people to be satisfied with Google and actually stay longer on sites supporting them and clicking on their ads, enjoying content recommended by Google and other things that support Google’s reputation for delivering content relevant to people using their search engine. When you’ve got a good piece of content what you can do is you can add to it, you don’t have to do something and then say that’s it, I’m never updating that again. What you do is when you’ve written a blog article you can re-edit it later to make it better. Don’t edit the URL, that’s the one thing you wouldn’t edit unless you really have to and you understand about 301 redirects, but you could edit the title. You could add more to the body content, images, links, keywords and tags. If you looked at the traffic that was coming in and If you looked at some of the questions and surveys that you might have done with your customers, you could adapt that feedback, incorporate it into your content and republish it. The key is once you’ve republished it, send it a bit of love. Send it some traffic by posting about your update on social media or by advertising. This is an example here from one that I did for my picture framing business which is about a needlework design survey. This was leading into an article about needlework framing. I was targeting people that did needlework. I just asked them “this” or “that”. 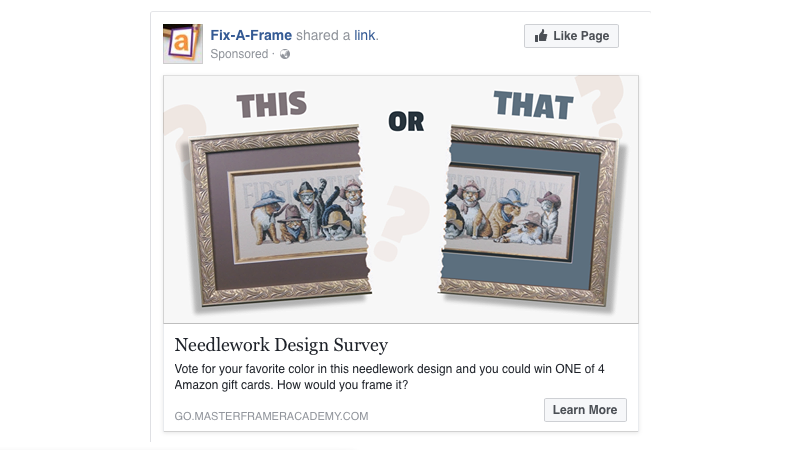 The advertisement linked to a survey and then took them onto some content about needlework. What happens after you’ve done that is you need to have a pathway to take the customer to the next level in the process. The next stage of ISBO is crafting the ascension path for each piece of content. It is important that you create pathways for prospects to take after they engage with your content. You need to take them along an ascension path. Well, in the example of the needlework advertisement and content that followed, the ascension path from that post was to hopefully encourage the prospect to buy this DVD which was about needlework framing techniques. It was a low dollar offer sometimes called a “tripwire”. This served two purposes because I would either sell someone the Needlework Framing Techniques DVD or if they were local to me, they would come in to my store and trust me because I’m now positioned as the authority when it comes to framing needlework. I’d taken them through this journey of where I had demonstrated my authority on the subject and also I was showing them my authority by publishing content. From wikipedia: The word authority (derived from the Latin word auctoritas) can be used to mean the right to exercise power given by the State (in the form of government, judges, police officers, etc. ), or by academic knowledge of an area (someone that can be an authority on a subject). Although this was the first step of the ascension path, it doesn’t end there. The first step was a small commitment from the prospect by way of submitting a survey. The second commitment was purchasing the low cost offer but that was actually part of a sequence. After they had purchased the DVD there was offer for an advanced cutting course which was the next logical step and a higher level of training. Then there was a membership offer to join a private club. The club membership requires a monthly financial commitment and is one of my core products. They are offered a choice to become a member. If they didn’t become a paying subscriber they were offered a free trial which is a down sell. 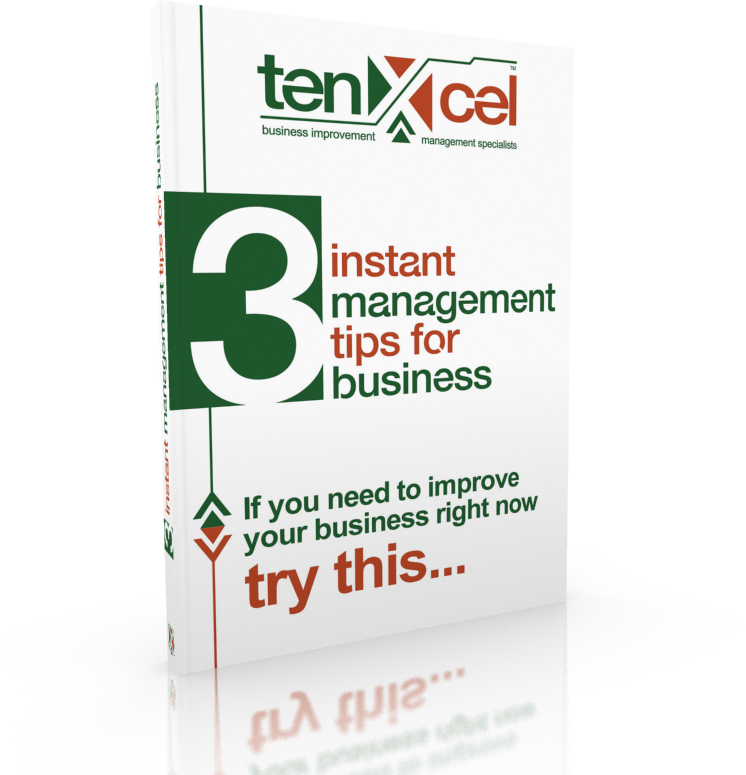 What you need to think about is how you’re going to move people through the process with your business. That’s a basic look at intent based search optimisation. There are other refinements you can make to help with ranking your content in the search engines like earning backlinks, gaining mentions and receiving social attention though likes and shares but these social signals are largely off-page and will occur naturally over time if you provide good quality content to your readers and prospects. You’ve got the basic sequences outlined to get you started here. In the next part of my series on accelerating your customer journey I’ll be talking about something I call “Light the path” which is another important part of making your website effective and successful for your business. Here is a video of a presentation of “Accelerate Your Customer Journey” made to attendees of The Lord Mayor’s Small Business Forum on the 8th June 2017 at Virginia Golf Club.